Since there are two Moons this month you may be dealing with more emotionally charged issues. Watch the way you respond, since you can actually reverse difficult circumstances by choosing a more appropriate action or response. Watch out for accidents. You’re more easily distracted now, and that lack of attention can contribute to little accidents. This is not a good time to venture into risky territory. 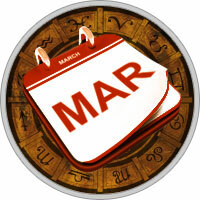 Family pressures mount during the Moon on March 2, but you may have brilliant solutions for dealing with them. Spending time with friends from March 1 to 17 can be enjoyable, but if you’re holding a parly, tiy March 5, 13, or 14. Love relationships reach a new level from March 1 to 8. Later, you may feel uncertain. Talk over your concerns with a trusted advisor during the Moon on March 31. Unreliable assistance from others can lower your productivity. With Mercury retrograding from March 10 to April 1 you’ll run into trouble if you’re over-committed, and there are indicators that you may have to pull back on an agreement due to slow progress, interruptions, or delays. Pushing against the tide wastes resources, but paying attention to problems may lead to a successful outcome after the Moon on March 17. Working with others toward a common goal provides a chance to incorporate your versatility into new avenues from March 1 to 15.